Returning from Austin to Longmont for the holidays, we are retracing our route through Kansas. We intended to stop in Dallas to visit the Gillis family which already placed us on I35. Otherwise we normally take Hwy 183 to Amarillo for the path through Raton Pass. The reason for revisiting the blizzard drive is that we want to stay another night at our lodging discovery – the Midland Railroad Hotel. It’s just so comfy. For the same price as the rotting Holiday Inn on I40 in Amarillo, we get cozy atmosphere, charming and caring staff to chat with, and amenities that would make the everyday business traveler salivate. Karen made the reservations on the road after departing Dallas so we would have a good arrival estimate. The staff remembered us – no doubt because we share surnames with the proprietors Heddy and Thomas Mahoney. After a 13 hour 700 mile day, we reached Wilson, Kansas and were given the keys to our old room – 313. And it’s a real key to an antique 5 panel oak door. No key cards at the hotel used to film The Paper Moon. After dropping off our bags in the room, I descended into the hotel basement to the Sample Room Tavern. 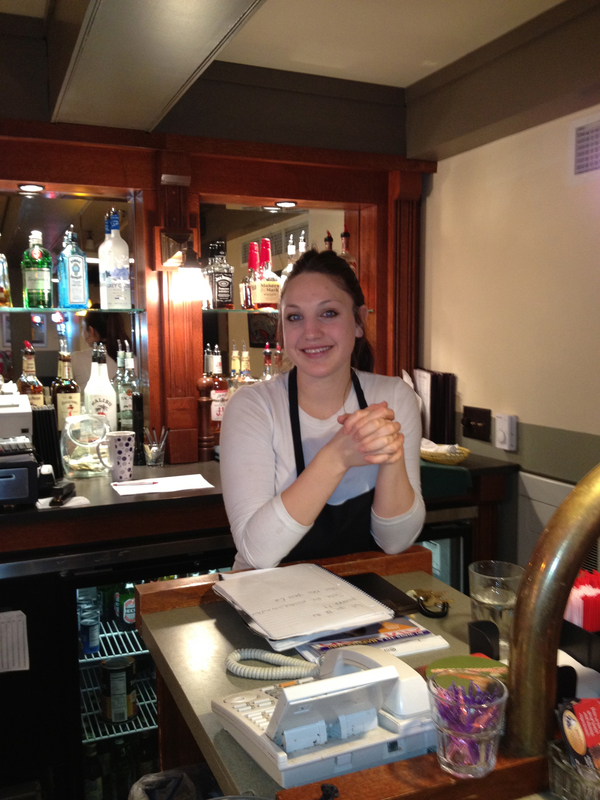 There, Jena Mahoney – pictured – served me a Pilsner Urquell and conversation. I now know the town of Wilson has approximately 900 residents, Thomas is an airline pilot, Jena’s brother is in the Air Force while another brother builds planes at a nearby shop. Jena talked about the hotel too. Her dad purchased it roughly a year earlier at auction and they are steadily establishing a presence among Kansas travelers. It goes without saying that I highly recommend the joint. It offers all the key business amenities from pervasive wifi to an early complimentary breakfast and late night tavern, while also capturing the ambiance of a B&B for a weekend destination. We returned. There’s something about this place that makes you feel comfortable. Guests talk to one another like students in a dorm. The lobby living room, the dining room tables, and the tavern are designed to bring strangers together. Jena asked us about our holidays and shared her plans with us. She’s excited for the murder mystery party the hotel is planning for New Years. It will be a 1920’s gangsta costume party. Sounds worth staying for. But we have to get Brit back to Denver for work and we have our own neighborhood party to attend. It’s been a nice vacation. Hope all my readers have enjoyed the holidays as much as I have.